Participants in the Temple B’nai Abraham Pe’ah Garden program. JULY 5, 2018, BOSTON – Combined Jewish Philan­thropies (CJP), Greater Boston’s Jewish Federation, announced the seven organizations that will receive a total of $28,300 in grants for programs to strengthen the North Shore Jewish community for fiscal year 2018-2019. Caring – How can we ensure that every vulnerable person has access to the services to move from crisis to stability? Justice – How can we provide opportunities for effective action as Jews to collectively build a more just and peaceful world? Learning & Living – How can we connect more people to Jewish life and learning to enhance their lives and shape who we are as individuals and as a community? Israel – How can we inform, engage, and empower our community to effectively engage with Israel’s future? BBYO aims to create a lasting connection to Jewish identity and bridge generations of Jews. BBYO will use this grant to partner with Jewish Family & Children’s Service and connect teens to the senior community. Epstein Hillel aims to provide a Jewish education for children representing all branches and expressions of Judaism. This grant will allow the school to expand its Jewish Studies curriculum by including a more traditional lens to students’ experiences. This grant will be used to develop a plan to engage congregations in work with immigrant families; to work with rabbinic and lay leadership to identify and train congregants about social justice issues and ECCO’s campaign to protect immigrants. This grant will be used to expand services and local Jewish program offerings to students at Endicott College and Salem State University through the Hillel at each school and through joint programs between the schools. Jookender will use this grant to introduce Russian-Jewish values and Judaism-rich heritage to members of the Russian-speaking community through activities and programs designed to encourage families to rekindle Jewish identity in the Jewish community. Jookender aims to build a strong community on the North Shore through activities and programs. 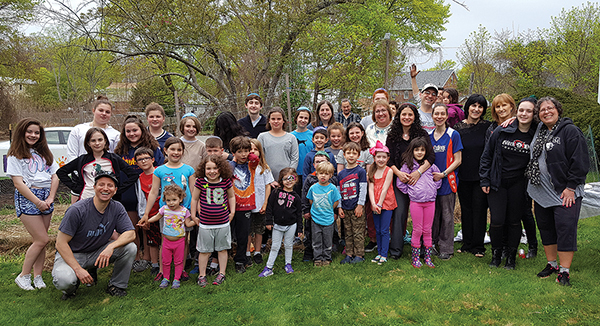 This grant is for Temple B’nai Abraham to build a North Shore Jewish Coalition of people, affiliated and unaffiliated, who will focus on sustainability and environmental issues. Temple Sinai will use this grant to enhance and expand its Israeli Folk Dancing program with the goal of promoting a love of Israel and Israeli dance. Temple Sinai aims to improve interfaith and intercultural relationships by forming friendships through dance and performance at community cultural events in hopes to engage unaffiliated Jews and Jews of different denominations with the synagogue.